New management border between river and sea in the Tana River mouth. A new border between the River Tana and the sea was passed on by the municipal of Tana the 19th of December 2014. The deadline for handing in complains expired the 19th of March 2015. Read about the new border here, and what effect the change has for angling in the river mouth area. The new border between sea and river has three fixed points. This allows most of the delta area to be included on the same time as the strait near Lávvonjárg is left outside the river area. On the west side of the river mouth the border goes from the outermost headline. This is the same border point used for the Tana River Mouth natural reserve. 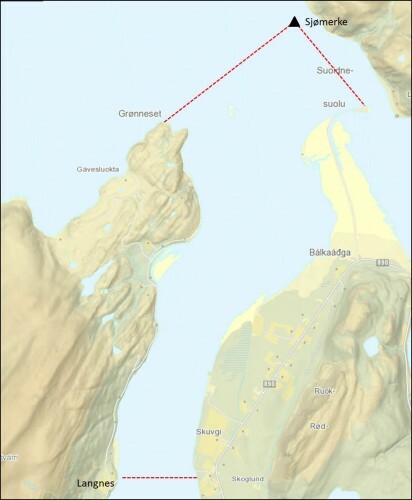 In northeast the border point is the seamark number 85814 M. In southeast the border is at Høyholmen; the informationboard at the parking lot. The Tana River Fish Management sent a demand of a correction of the border in 2012. This was done after requests from local fishermen. The outermost part of the river mouth area had become a free space for anglers, angling for the same Sea trout as the angers in the river zone. 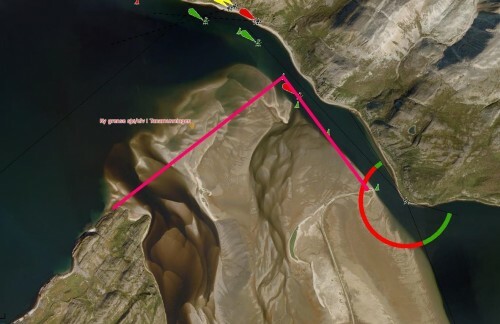 The guidelines given by the Norwegian directorate for setting borders between river and sea says that the whole delta area should be included. The old Tana law obstructed the modification of the border for a long time, but after the new Tana law bacame operative in July 2014 it was finally time for a change. The Tana municipal arranged a inspection in the river mouth for local groups in late August 2014. The suggestion for a new border was sent to a consultation among groups that may be affected. The new border was passed on by the municipal of Tana the 19th of December 2014. The deadline for handing in complains expired the 19th of March 2015. The minicipal didn´t receive any complains, so now the new border is finally official. Map of the river mouth zone (Langnes – Tana river mouth). The outermost part at the west side of the river mouth is a pretty good area for Sea trout angling. In the river mouth zone (map) the fishing season is limited to the time between 15th of July to the 31st of August. This rule is given to ensure the salmon smolt migration a free passage on their way to the sea. The outermost stretch has been a free zone where anglers didn´t have to buy a license, and where they didn´t have to care for the seasonal limitation. Now this stretch is included in the river area. This will lead to better control over the total catch of trout and a better protection of salmon smolts. This may also lead to higher income for the local fish management, but gives also a larger demand for more presence of river guards in the area. 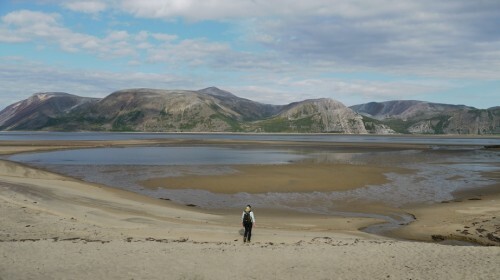 A sandy bay at the westside of the rivermouth at low tide which now is a part of the river area (foto: Narve S. Johansen). Sum up of rules in the Tana River mouth. As the fishing zone is almost an exclusive Sea trout zone, where anglers almost never catch any salmon, the fishing rules are a bit more gentle that in the rest of the watercourse. Full fishing time in the season. No limitation at any hours in the day, or day in the week. Tourist anglers are allowed to use lures. This is the only place in the Tana Watercourse where anglers can use worms as bait. This is the only place in the watercourse where anglers can do trolling while their boat motor is running. Remember that all Sea trout and Arctic Charr less than 25 cm has to be released. Tana River Fish Management like to emphasize that tourist anglers must be in company with a local fisherman in the boat, as in the rest of the Norwegian parts of the Watercourse. The boat must have a license plate for the Watercourse to be allowed used in fishing activity. The Sea trout gather in the river mouth and in the inner part of the Tana fiord each summer to feed. The trout spawn and live their young years pretty much all over the Watercourse, eaven up in the tributaries of Anárjohka and Kárášjohka.